I’d tried a couple mug cakes before, so I thought it would be a fun and spontaneous tie-in to make our own Mr. Funny snack. I did a quick internet search and gave Hannah the choice of flavor. She picked vanilla and I found a recipe. We each mixed our ingredients in small bowls and took our turns in the microwave. Hannah was delighted! If you haven’t tried a mug cake, give it a shot. There are a lot of recipes out there, and it’s a fun quick treat. A cup of cake! 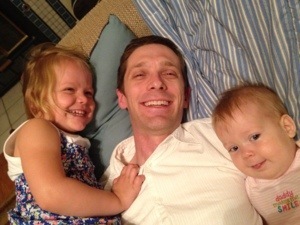 Happy snuggles on the couch. Brett picked out some yummy desserts at a new local bakery for tonight’s steak dinner, and yesterday I tried a new recipe combining three of his favorite foods. 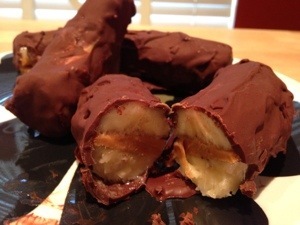 Cut bananas in half and spread in peanut butter. Then freeze. Melt 1/3 cup chocolate chips with 1 Tbs coconut oil and cover bananas. Freeze until chocolate is firm. Yum yum and more yum. 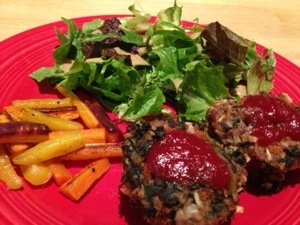 Instead of meatloaves, I like to make “meat muffins,” often with spinach or other vegetables in the mix. They are tasty and always a hit with Hannah, but they don’t look particularly appealing in a picture. I’ve tried shooting a couple different meals. Another meal whose picture did not live up to its tastiness was creamy (and dairy-free!) 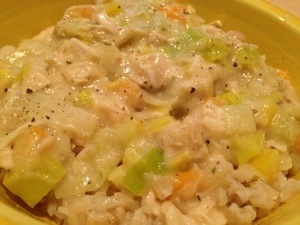 chicken and leeks on rice. The taste was yum but the photo was blah. But more color doesn’t guarantee an appetizing photo. 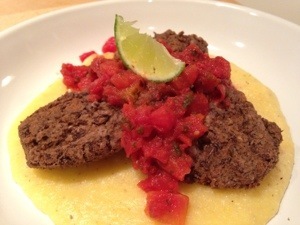 Check out my black bean cakes on polenta with a roasted tomato and green chile sauce. This was a Diana original recipe, and it was delicious. Brett was disappointed to hear we didn’t have any leftovers the next day. 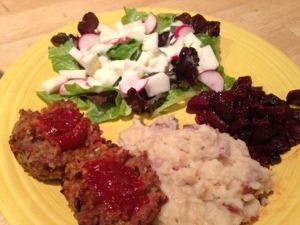 But, it turns out black bean cakes are just not appealing on camera. I’ll leave you with a good picture. 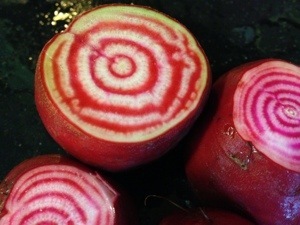 We got these beets in our CSA basket. I forget what the variety was called, but they were gorgeous! Some of my readers have small kids, so conversations like these happen every day. But for my readers who haven’t been around 3-yr-olds on a daily basis for a while, I thought I’d share some things Hannah has said that make me think about things. In one of our Texas books, there is a picture of bull riding at a rodeo. Hannah was confused about this, so I did what any great parent does to explain things: I found a YouTube video. When the rider was bucked to the ground, Hannah exclaimed, “Oh good! He got off!” I tried to explain that the rider actually wanted to stay on. She wasn’t buying it, “He really wants to get off.” It made sense. In her eyes, why would anyone want to stay on a violently jumping cow? Good point. What does it mean to be dead? Why do I have to wear pants outside? Why can’t Violet walk? I put shoes on her. Is five minutes a long time or a short time? Why do you drink Coke if it’s not healthy? When you eat ice cream does it make Violet’s milk cold? 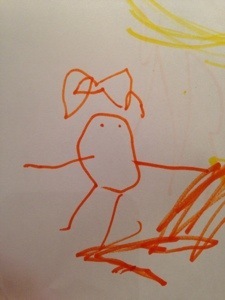 Here’s a fun picture she drew for Aunt Kristen. 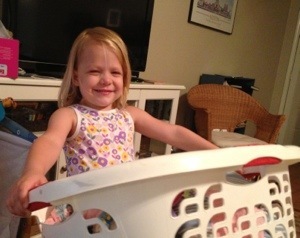 Life to a 3-year-old is full of new ideas and experiences, and it’s fun to be along with her for the adventure. Last year, we jointly bought the largest plastic pool we could find with some friends. 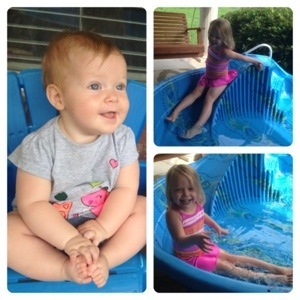 They have a great space on a shaded porch, and the kiddos spent many happy afternoons last summer splashing away. It’s officially summer because the pool is back out, and we had our first swim date this year. Violet was just an observer. Eight months old! 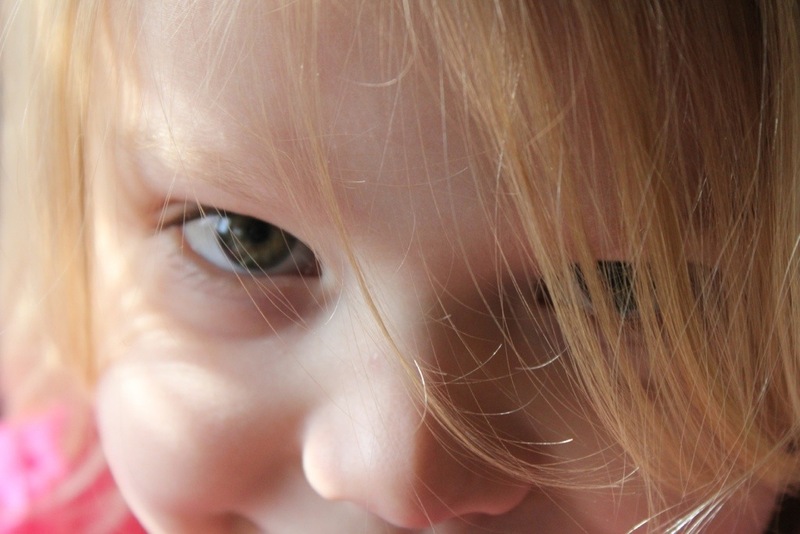 Looks like she’ll be a strawberry blonde, blue-eyed cutie. 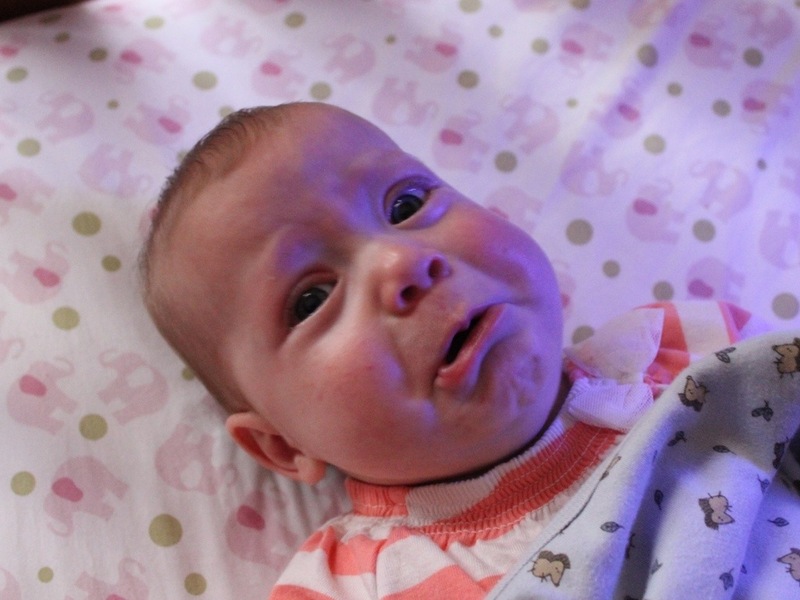 No crawling, no standing, no sleeping through the night, no sign of teeth. 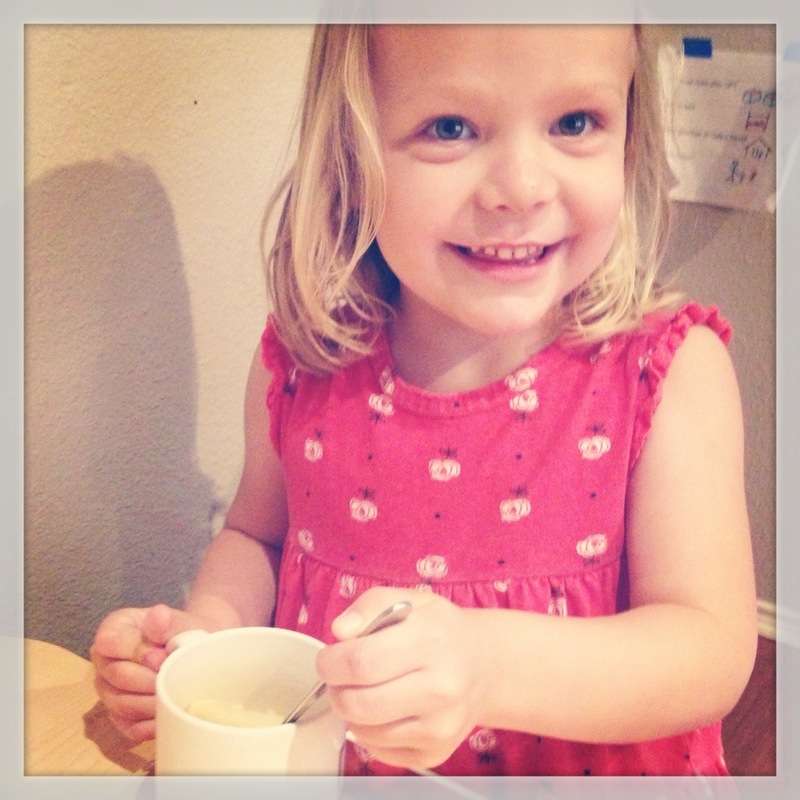 She loves bananas, avocados, applesauce, pretty much everything. Some days I feel like that. Except I would have the covers pulled over my head. Wanna know something funny? I am an extreme introvert. Do you know what that means? It means I get my energy from quiet, alone time. Lots of it. It means after being around noise and people for a few hours, I feel like I’m going to completely have a melt down… Do you think I was “cut out” for this? Patient? Ha! No, but to keep from losing it all together, I have to die daily. I have to crucify my flesh every day. It’s painful. But it’s what we’re called to do. It’s just that most of us would rather run away from the means by which He wants to use in our lives for that daily dying. I’m just thankful for each new day where I can try to do better. And though children are quick to cause frustration, they are also quick to extend grace and forgiveness. When it seems like everything is going wrong, I can look back and see I really do have a few more things figured out than I did a year ago. So there’s big-picture growth.